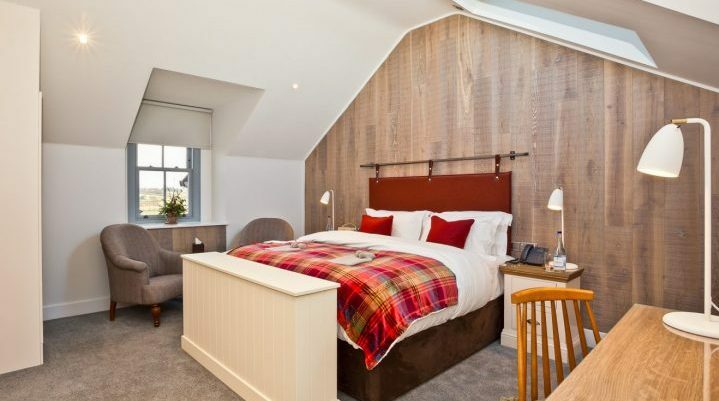 Pentonbridge Inn is a gem right on the border between England and Scotland, offering an exceptional dining experience and luxurious rooms for an overnight stay. Each room is named after a Border Reivers clan infamous for raiding and marauding their neighbours – though, thankfully, the atmosphere at Pentonbridge Inn is one of utmost hospitality. We stayed in The Grayme, right in the loft of the building. Our room was named for a particularly lively family said to have made many enemies. The Graymes (or Grahams) feuded frequently with other families, especially the Bells, the Musgraves and the Maxwells. The name originates from old English graeg-ham (grey home). Our room was sumptuously decorated, with velvet, tweed and wool textures and soft, natural colours. The rooms have all the best flourishes: Egyptian cotton sheets, fresh flowers, and homemade biscuits by the kettle. We were also pleased to find a pouch of salted caramel chocolates and a TV that rose from the foot of the bed on demand. At night, you can even watch the dappled stars through the skylight, before rolling up the automated blind for a decent night’s kip. It’s also wonderful, come morning, when you wind the blinds down to have the sunlight spilling onto the bed while you drink your first cup of the day with salted caramel chocolates. The bathroom had a separate shower and bath, which exquisite toiletries and all the fluffy towels you could feasibly need. I had a bath on the night and a shower in the morning, so I can verify that they offer a relaxing soak and a powerful spray, respectively. You can read all about our fabulous dinner (from the tasting menu) here! For breakfast, we had an epic one-pan English breakfast, with fruit and oats to start us off, plenty of fresh juice, and steaming hot coffee. We could see the glorious countryside and the nearby Scottish border, with the delicate dusting of ice on the fields. Overall, Pentonbridge Inn is an exceptional destination with fantastic food, excellent service and delightful rooms. We highly recommend you visit on your next trip to Carlisle. To celebrate the first month of the new year, The Pentonbridge Inn is offering dinner, bed and breakfast for £220. Dinner will include three courses from the a la carte menu created by husband and wife chef duo, and Marcus Wareing protégées, Jake and Cassie White. Dishes include Fallow venison from Millbank parkland, parsnips and sauternes poached quince; Orkney island scallop, pumpkin agnolotti, bacon marmalade and violet artichokes; and Roast cauliflower, polonaise, wild mushrooms and cured Tamworth pork. After dinner, guests can retreat to one of the nine luxurious and stylish bedrooms. The offer is priced at £220 per couple per night and is available from Wednesday – Saturday during the month of January. For bookings, please call Pentonbridge Inn on: 01228 586636 or email gm@pentonbridgeinn.co.uk to make a reservation. Visit pentonbridgeinn.co.uk for more information.